This article will give you an overview of the different designs of RV generators, how generators operate, and some basic generator service tips. It will describe differences in gas-powered generators and diesel-powered generators and how they function. This information will often help you determine the cause of generator problems. First of all, there were “rough campers.” These people used only a tent, a sleeping bag, a backpack of dried foods, bottled water, a few matches, a snake bite kit, and not much else. And you know what? I've been there, and I've done that! It was fun! Especially when I was young, healthy, strong, and had very little money. And, later in life, when I was first married, and we had kids, I rough camped then too, at camping resorts at beaches and in the mountains. We used larger tents, nicer sleeping bags, inflatable mattresses, a small cooking grill, several coolers for real food, and a few more accessories. And that was fun too! After a few years, we purchased our first tag-along camper. It had rudimentary plumbing, electric lights, storage cabinets, a "porta-potty,” more comforts to deal with the vagaries of the weather, and, of course, even more accessories to make our camping more fun. Those first old campers of ours way back then had your basic accessories, such as electric lights, a water pump, a propane stove, and such. But, really, not a lot else, and especially not such things as television, air conditioning, hot water heaters, microwave ovens, and all of the amenities that you will find as standard on the RV or camper of today. Our first couple of tag-alongs, way back then, did not have a generator. They had a battery. This was usually just a deep-discharge type of 12-volt DC battery, the same as that used in an automobile. It was usually tied down onto the front end of the tag-along, in a plastic case, to protect it from the weather, and you charged it up before you left home. And, considering it only had to power a few 12-volt interior lights, and maybe a small water pump to provide water at the miniature sink, it was more than adequate for a good week of fun. Over time, as some campgrounds began to provide 115-volt AC at your site, camper manufacturers added small, efficient AC-to-DC converters, so your camper battery was kept charged at the site. And once you had an RV with AC as well as DC power, along came dual-mode light systems (110-VAC and 12-VDC), as well as connections for small appliances. RVs came to include showers, electric hot water heaters, larger water pumps, microwave ovens, and wall receptacles. My motorhome batteries sit on a shelf that is open to the weather on the backside. They were getting dirty so I found this great battery box on the web and put my batteries in one each. Now, the batteries are kept clean of road dirt by the box and hopefully they will live longer for me. Manufacturers' most important electrical addition to RVs and campers was extra electric receptacles, in the kitchen, bathroom, bedroom, and so on. People started bringing those favorite appliances from home: coffee makers, hair dryers, toasters, portable TV's and radios, and on and on, and on. RV manufacturers had to react by adding electric breaker panels (versus those old fuses) to handle potential overloads, and heavier wiring for the current pulled by everything. Finally, the world of camping became accustomed to using such appliances everywhere: in state parks, in the woods, alongside streams and lakes, and pretty much wherever they went. So, the next "necessary item" for the typical camper of today is—you got it—a good electric generator. We all want that power, everywhere, all of the time. At the flick of a switch! Today, the average camper or RVer travels much further to reach their camping destination. They often have to stop for the night at an interim campground or two along the way, or do the Wally-World thing, or stop and sleep at a rest stop or public parking lot. And then move on in the morning. When taking such trips, they usually have a fridge that is packed with fresh food and beverages, and so they are able to eat very good meals and then sleep in that comfortable bed in the camper. Myself, I have pulled into a rest area around 6-7 PM, fired up my generator, turned on the TV for local news and weather, eventually cooked a light dinner, and watched my favorite network TV shows, all with the AC running, and finally I'd go to sleep in my nice cool camper, on my own bed. Often, in a rest area, I will leave the generator running all night, along with a couple of roof fans, recharging my house batteries and providing just enough background noise to drown out most of the outside noise from the comings and goings of other vehicles, campers, and truckers in the rest area. I will get up in the morning, make fresh coffee, toast a muffin, and boil or fry an egg for a hot breakfast, maybe even take a hot shower, all before I shut down my generator and continue my trip. Now I have a motorhome, with a built-in generator that is designed especially for the appliances in my RV. It is ridiculously easy to operate. And, often, parked right beside me, might be a Class-C, a Fifth-Wheel, or a Tag-Along, all with their own built-in generators, providing those creature comforts we are all spoiled with. Ain't camping life a rough life? And, even if you don't have a built-in generator, many campers use portable power generators when they camp in a rough site somewhere. There are many good portable generators around, and they are relatively cheap, for what you get. Every motorhome manufacturer today that included an electric generator in their design has also added one little safety trick. That is, the fuel line for the generator is no longer attached to the bottom of the RV’s main fuel tank; it is attached about a quarter of the way up from the bottom. It will only pick up fuel if the main fuel tank is more than 1/4 full. This redesign was intended to avoid the situation where a camper out in the middle of nowhere runs the generator until it uses up so much fuel that there isn’t enough left to drive the vehicle to a gas station and fill up again. So, if you are out somewhere rough camping and your generator won't fire up when you turn it on, check that your fuel tank is more than 1/4 full. And if your rig is parked on a slant, the tank may have to be even more than 1/4 full for the fuel level to reach the line to the generator. Also, many built-in generators won't start if the oil is down to one quart or less. That's one reason you should check the oil in the generator often. 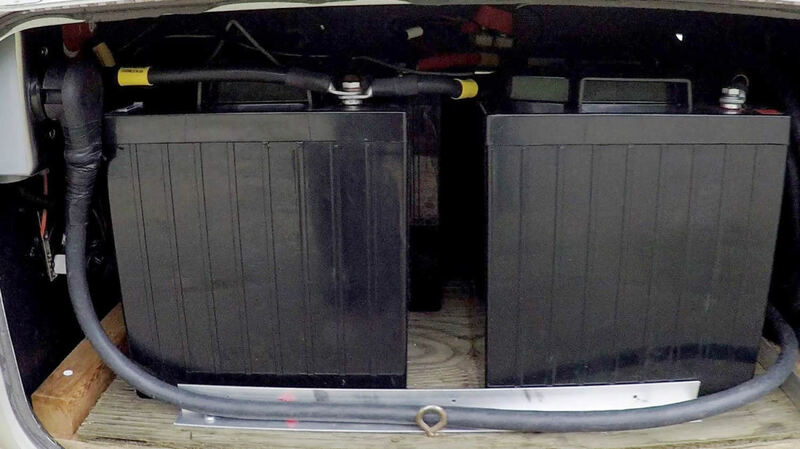 Your built-in generator needs power from the 12-volt coach battery system in your camper or RV, including to get started. If the power switch to the coach's 12-volt accessories has been turned off, for example to prevent power draws while the vehicle is in storage, the generator can't get power. 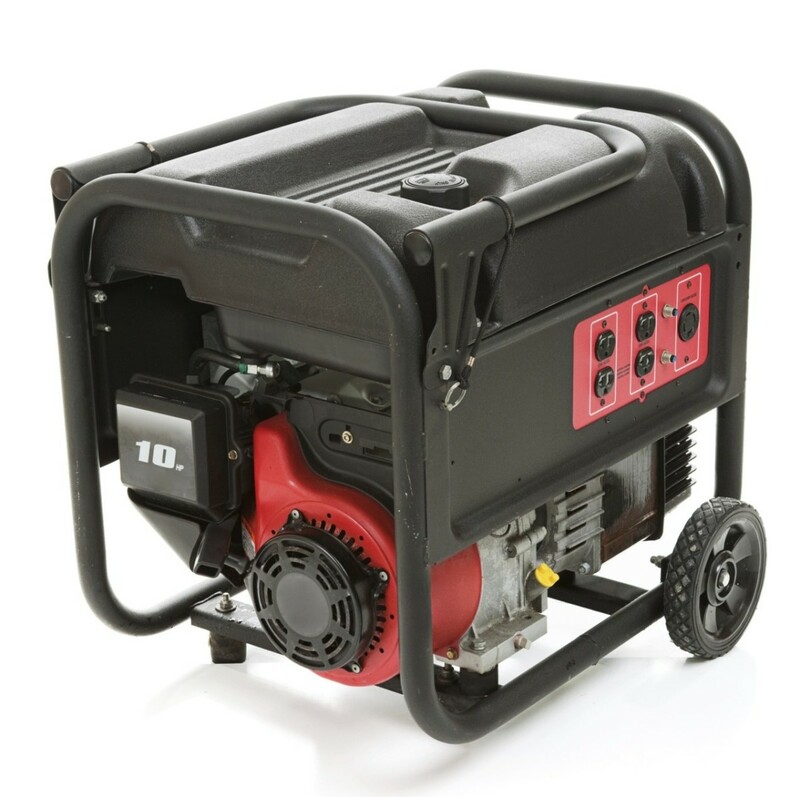 If the generator won't run, or runs sluggishly, and there are no fuel, oil or connection problems, the generator itself may be bad, and if so, the fuel filter (which can become clogged, especially when using diesel) and fuel filter are common culprits. Understand How Your Generator Works! If you use an electric generator, you must understand how it works, so you can make sure it is there when you need it. First of all, It has to start, easily and quickly. Then it has to run, smoothly, automatically, and efficiently. Here are some basic facts about generators. There are four basic functional sections of an electric generator. Of course you can tear a generator down to smaller and smaller working pieces, but I am not trying to teach you to be a mechanic, rather I want you to know how one functions from a high level. From that you will understand the importance of those pesky preventive maintenance parts, and why they need to be monitored and replaced occasionally. Generators are run by a fueled motor of some kind, usually gasoline or diesel. The motor uses the combustion of the fuel to keep the crankshaft of the motor turning. Today, there are many different designs of motors, from the simple to the complex. An example I can describe here is a simple, cheap gasoline-powered lawnmower motor with two cylinders. Each cylinder contains a piston which is connected to a crankshaft. Each cylinder has a fuel input port and an air input port, as well as an exhaust port. The two cylinders are designed so that when one cylinder is firing, the other one is getting fuel and air to fire. This whole assembly is mechanically designed so that you will get continual firing and exhaust, and the crankshaft will turn from all of this combustion action in the cylinders. In a diesel motor, there is no sparkplug; the combustion is achieved via high compression of the diesel fuel. One of the most important things to watch is your generator motor's lubrication. Your generator motor uses oil to keep all of those mechanical parts running smoothly as they rub against each other. You should always assure that you have enough oil in the motor, and that the oil filter on the motor is changed as scheduled by the manufacturer. Some electric generators are air-cooled. But as your generator gets larger, it will often have a cooling system similar to an automobile engine, use a water-antifreeze cooling liquid. When this is the case, you need to check the level of the coolant reservoir regularly, and the level is kept within limits. And, as with an automobile, consideration must be paid to the antifreeze levels and strength for the season and region where you are using the generator. A stand-alone gasoline generator gets its fuel from its own fuel tank. The gasoline is usually fed via gravity to the carburetor on the motor. In the carburetor, the gasoline is mixed with air (or oxygen) and injected into the motor's cylindar where a spark is provided via a spark plug. This spark, causes the mixture to explode, and forces the piston in the cylinder to open, this moving the shaft of the motor. All of this is done via mechanical timing which keeps the motor turning. In a coach with a built-in gasoline generator, the functions are the same, but the gasoline comes from the coach's main fuel tank. A stand-alone diesel generator also gets its fuel from its own fuel tank. The fuel is fed via a fuel injection system directly into the cylinder of the motor, and mixed with oxygen there; then the piston is moved to compress the diesel fuel to the pressure necessary for it to explode. No spark is needed, nor is there any carburetor on a diesel motor. When the fuel mixture explodes, it forces the piston to move to the open position in the cylinder, thus turning the shaft of the motor. This cycle repeats itself via mechanical timing which keeps the motor turning. If the fuel filter gets dirty or blocked, even partially, then too little fuel will be provided to your motor, and it may not not run. If it runs, it may miss or turn off sporatically. In a gasoline generator, the spark plug will, over time, need replacement. It can become fouled with carbon or dirt, and eventually the contacts will wear out. If the fuel jets are blocked, then the motor may not run for lack of fuel. If they are worn, the wrong mixture will be provided, and the motor will not run properly. You can replace a fuel filter, and maybe even a spark plug if it is placed conveniently for you on the engine, but you really want a trained mechanic to deal with the replacement of fuel jets. Your generator has to be started by turning the motor until it goes through several firing cycles of several cylinders. 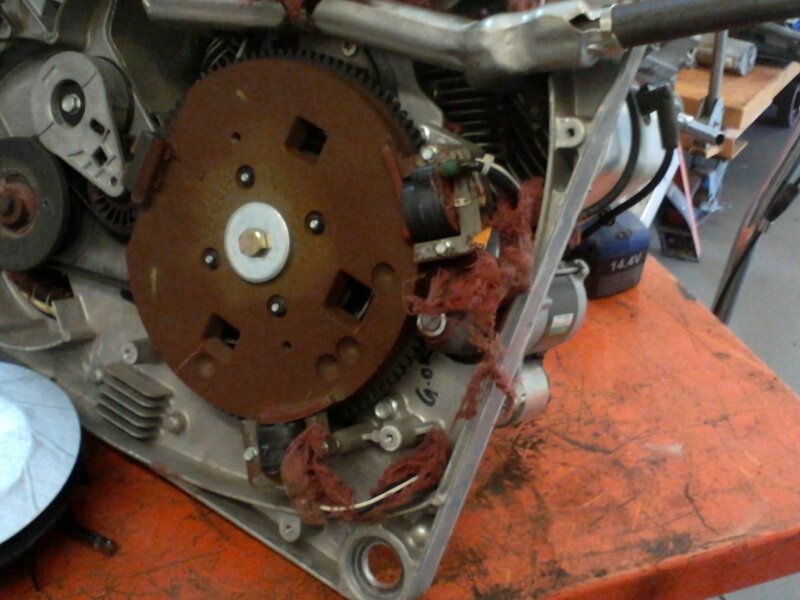 Once the motor gets going, the starter is no longer needed, as the motor will run on its own. The starter motor is electric and requires voltage to turn, and in your coach, this voltage comes from your house batteries. It takes a significant amount of current to turn your generator motor, even more with a larger-sized motor/generator combination. You should also know that because a diesel motor uses a higher level of compression to force combustion, it is harder to turn, and thus its starter requires significantly more current than a gasoline motor to get it to turn at a high enough speed. Your house batteries are in good shape, and hold a strong charge. Your connections to your batteries, as well as to your generator are clean, without corrosion, and attached tightly at each end. when your starter turns, it doesn't make weird sounds, and is turning the generator motor's shaft. Here’s a simple description again, this time of the part of your generator that actually generates the electricity. Picture a coil of wire wrapped around a shaft. This coil of wire spins inside the opening of a larger outer coil of wire. Visualize that the shaft of your generator is attached to the shaft of the fueled motor and turns when the motor turns. Leaving all of the electro-mechanics out, if you connect a voltage to the ends of the inner coil of wire, and spin it inside the outer coil of wire, and then attach something like a charger or inverter to the ends of the wires on the fixed outer coil of wire, you will get AC voltage from these output wires. Again, I have left out all of that complex design stuff like the magnetic metals used, the complex ways that the wires are wound, the contacts used, and on and on. I just want you to know that there are parts in here that sometimes require maintenance. Luckily, the generator itself is designed for minimal maintenance, and if there is a problem with yours, you need to see a trained generator mechanic. Even though I have owned several motorhomes, I purchased this book so I could see how other brands are wired. I found information on several different RV electrical wiring systems that I wasn't aware of and I have been able to help other RV owners who had electrical problems. I will now list the things that can, and should be serviced periodically. If you want your generator to last for decades, replace the parts below at the intervals suggested by the manufacturer. Running the generator once a month or so is a good idea. The fuel pump and fuel filter are the parts that most commonly give trouble. Here's an article with pictures on how I replaced a fuel pump and fuel filter in my Onan 5500 generator. If any of the terms or abbreviations in use here are new to you, check out my article on electrical terms. It might help. With a gas generator, I suggest keeping your old spark plug after you replace it, in case you need one in an emergency. Keep a spare, just in case, especially if you use your generator a lot. If the generator is running rough, sometimes you can remove and clean the air filter for better performance, as a temporary solution. Only a trained mechanic should service this. Check for wear or leaks, especially if you smell fuel. Inspect wiring periodically for wear, torn insulation, and loose connections. If necessary, get a trained mechanic to replace wires. Check oil level and change as needed, or when suggested by the manufacturer. These are easy to change. Follow the manufacturer’s instructions. Use the manufacturer’s suggested coolant (anti-freeze) mixture. Monitor the level regularly when using the generator, and keep the level within the limits marked on the reservoir. Hopefully, I didn't lose you with my attempt at simplifying how an electric generator functions. Our R.V. Generac generator has been working fine, but now it will not even turn over; no click, nothing. What can we check to get it working? Your generator gets its power for starting and for its fuel pump from the Coach 12-VDC batteries. So, of course, check that you have power from the batteries and that they are being charged by your Converter (which get's its power from the 110-VAC system. If you put a multimeter across your battery terminals, it should read around 13.5 VDC if charged and around 14.5 VDC if it is being charged. I suspect that this is your problem, but if the generator still does not start, or even "click" you will need to trace your 12-VDC to make sure it is present on the generator starter terminals themselves, and they are a little hard to get to. We can't figure out why the roof air in our motorhome isn't working with our 5000 onan generator while traveling. We know there is a 20 and a 30 amp switch on the generator, and then inside the RV, there are two switches by the door; one switch says main battery, and the other is a diff battery. The air works fine while plugged in at camp. We are new to this RV and camping thing, and cannot figure this out. Can you help us resolve this? The two switches are called Cut-Off switches and are used to turn OFF your 12-VDC from your Chassis and Coach batteries, so the batteries do not discharge while the RV is in storage. Your Coach batteries are used to power your power control panel as well as your temperature control panel and other equipment. So make sure your Coach batteries are fully charged before you check anything else. I am pretty confident that your main problem is the charge on the Coach batteries. How many batteries are there in a 1985 Ford Tioga RV? I don't have any specs on an RV that old (1985) but, typically these older Class-C motorhomes will have an engine battery and it will have another 12-VDC battery for the interior accessories and other equipment that operates on 12-VDC. Having such a second battery takes any load and current draw off of the engine battery, so the Rv is always ready to start and go. why are our RV's TV and refrigerator not working when we are plugged into the electricity? Without knowing what design RV you own, I can only guess at which systems yours uses. So, Your TV's typically use receptacles that are powered by your INVERTER, so they will operate when you are Boondocking and don't have external electrical power. So check that the Inverter is operating. 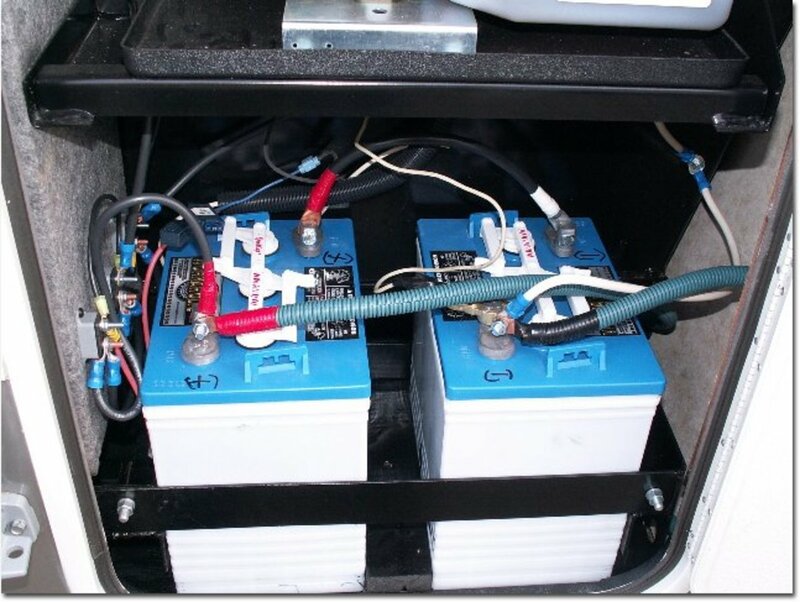 2- Considering that your Inverter operates on your COACH battery, you should check that it is operating properly. 3- Your fridge should operate on 110-VAC when your RV is plugged into external power, BUT the fridge control circuit board operates on your COACh battery. I would suggest that you check your Coach battery and that it is being charged properly by the RV Converter. Our onboard generator starts just fine. I let it run for maybe 5-7 minutes before slipping the 30 amp switch to begin sending power to the appliances etc. They (the coffee maker, microwave), show they are getting power, but then it clicks off. After maybe 30 seconds or a minute, it will look like they are on again, only to click back off again. Do you have any thoughts? You didn't tell me what kind or model Rv you have, but most that have a built-in generator has an automatic power sensing system and transfer switch, so I assume you have your 30-Amp Main Breaker turned OFF? Placing a normal load on your generator should not force it to turn OFF. If your load was too much, then one of your AC-Voltage breakers should have kicked OFF instead. A good generator should operate normally with a load on it. So, I suggest that you check out your generator as follows; 1-change the fuel filter on the fuel input line, 2- check the electrical connections for any loose wires, 3-If these things seem OK, you should get an electrician to service the generator for you and find the problem. Can I run the generator on my RV to power an appliance, such as a toaster oven, while I am driving? Yes, of course. Your generator will provide power to ALL of your electrical devices when not plugged into external power including a toaster and even your roof AC. I have a 36-foot leprechaun class C RV with no generator looking to buy a gas power generator 1500 watts starting 1200 watts running will that work? The first thing to do is check if your Leprechaun has a space designed for a generator? With some models the manufacturer will design a specific cavity (storage area) for a generator as an option. If this is true with yours then you are lucky in that you will already have the mechanical strength to support a generator, and you may even be able to purchase the wiring etcetera that will make installation easier. On the other hand, you could be an owner who will use the generator as their external power source and then you only need a modified power cord. Be aware that a permanent installation will require some special wiring that switched your RV automatically from External power to your generator. My point is that this will only power half of your 120- VAC appliance and by the way, your Air Conditioner uses 220-VAC, or in other words 2 separate 120-VAC lines. What might cause a new generator in a new camper to turn on, but only run for a minute or so? The top two problems with generators in RV's is the fact that they sit for a long time and the fuel filter and the fuel pump both get gummed up. So, check the filter and fuel pump. They are an assembly mounted under the chassis under the generator, and they're relatively easy to change. There is also a little secret about generators on RV's. Long ago, many people would go out into the Boondocks and run all of their gas from the RV tank and then not be able to get back to civilization. So, Rv manufacturers would only run the fuel line for the generator 3/4 of the way down into the RV fuel tank. That way the RV owner always had enough gas to get out of the Boondocks. Check that your RV fuel level is above 1/4 tank. I'm new to RVing, and I have a brand new motorhome with an onboard gasoline generator. A helpful camper showed me the altitude adjustment when the city power went out in Albuquerque, and the generator would fire, but not stay on. When we got just about to Oklahoma, the generator turned off on me. I went to adjust the setting and discovered the generator cover was gone (that may explain at least one of the weird noises). Could I run the generator without the cover, or will that actually damage it? Your generator can operate just fine without the cover. But, you need to get another one from the manufacturer because it is part of the noise baffling system and the noise will not just irritate yourself but your neighboring campers. FYI: If your new RV has sat for a long period of time the fuel filter for the generator may be partially gummed up from sitting with fuel drying up in it. I would look under the chassis where the RV generator is mounted, and you should see a fuel pump/filter combination there. Get the model number and purchase a new filter to see if this is why it isn't running properly. 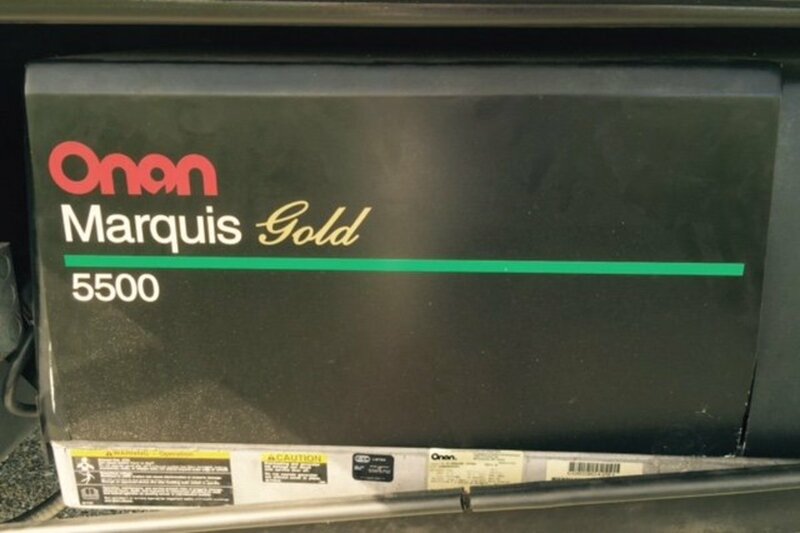 My Generac seized up, so I'm shopping used Onans. Do you think I need to buy the Onan install kit to put it in? I would recommend that you get the install kit. Otherwise, if you have problems in the future, you will probably suspect your custom wiring as your culprit when things go wrong. The power in the campground went out. Do I have to turn the electrical breaker switch off before starting the generator? An RV with a built-in generator will automatically switch over to the generator when you start it, and back to shore power when it is turned off. This is a safety feature in motorhomes. I have a 1976 Chevy G-30 1-ton Marathon motorhome. Where are the generator and the turn-on switch located? Our generator is on but our microwave is not getting power. How can we connect the microwave to our RV's generator? I have a 1997 Allegro Class A. When I turn the ignition switch to off the generator shuts off. What do I do to keep it running without the ignition switch on? The generator does not use the engine power, and the ignition switch should not have any effect on its operation. So, I would check that the MAIN and AUX (12-VDC) switches are turned ON so that the generator can have 12-VDC to start and run. Otherwise, there is no reason for this to happen. My motorhome has a diesel generator. Why does the generator operate off of the house batteries instead of the chassis batteries? It seems to me that weak house batteries will prevent a generator from starting up in extreme heat, forcing the air conditioners to operate. Is there a way to switch the wiring system from house to chassis? The philosophy with motorhomes is that you should not have any superfluous appliances loading down your chassis battery. It is definitely not recommended that you "redesign" your RV wiring away from the standard configuration. The standard system design you have works well, and the power control panel would not operate correctly if you change the high-current wiring. will a 3,000-watt generator operate the A/C while parked? The built-in generator of motorhomes, if it is a 3K or a 5k, are typically designed to provide adequate power for all of the internal 110-VAC equipment and accessories. Sometimes, the user can have too many appliances plugged into the RV receptacles and cause the main or one of the receptacle breakers to kick out. I have a 96 class a motorhome. I am new to roving there is black soot on the generator I took it to a nearby shop and had the generator exhaust pipe rehang with a new hanger. Do you think the black soot could have come from exhaust pipe being separated from the generator? Back in the day before automobiles were computerized, it was common knowledge that 1- if your gasoline engine smoked and it was blue, then you were burning oil, and 2- if your engine smoked and it was black, it was "burning" gas. Ans, if your generator exhaust was disconnected then, yes, the exhaust could be getting inside the generator housing. Check the total hours on the generator before you start to get an indication that it may just be worn out or not and need replacement or an overhaul. If it were me, I would have the generator 1-steam cleaned properly, 2- install new air filters, 3- change the engine oil, 4-install new fuel pump filter, and then have it "tuned up" by a generator mechanic. The mechanic will be able to tell you if the generator can be fixed or not. I changed the oil and filter on the generator in my motor coach and now the generator won’t start what could be the problem? It is a 33 0 diesel. Our heater just stopped working. We just got this RV and drove it twice. It says the propane is full. It’s a 2015 Thor Axis 24.2. Any advice? First of all, make sure your valve for the propane line is turned to "ON". Then, check that your propane is working by turning on one of your stove burners. Once these checks are run, then check that your COACH battery is fully charged because it's 12-VDC powers your temperature control panel. Check if the temperature panel is operating by turning on your AC. If everything operates OK, then your furnace itself is the likely culprit and needs to be checked by an RV tech. I have a 2003 Itasca MH other 50 amp service. It has an onboard generator that works fine. Can I wire in a 220-volt outlet from the fuse panel to run a 220-volt clothes dryer? I just bought a trailer and the AC, microwave, etc. won’t turn on when the trailer is on. I am a newbie. Am I missing something? 1- Did you turn the power box breakers to ON? 2- Is your power cord firmly plugged into the power box and your camper? 3- Is your trailer's MAIN power breaker turned to ON? These are the three essentials a newbie might not check. What kind of oil do I put in my RV generator? Read the generator owner's manual and it will list the acceptable products to use. Typically the recommended oils for most generators are similar to auto engine oils, but I would check what is recommended for my specific brand and model. I have a 2006 Conquest SE with an onboard generator. The generator starts and runs, but it does not seem to run anything. Is there a switch or something to make the appliances work? Why would a carburetor be a problem on a brand new Class C RV? The dealer is refusing to fix it under extended warranty, and blames us for not using it enough. First of all, a warranty is a warranty and they typically only have an end date or mileage limit. And I suspect that if you read yours, it will not say anything about how much you use your RV. Most newer RV's will utilize a fuel injection system rather than an old-fashioned carburetor, but whichever you have the Rv will have at least one fuel filter. These fuel filters are what will "gum-up" if they sit and the engine is not run regularly. Most people will run their Rv engine for 20 minutes or so every month just to avoid this kind of problem. So I would MAKE the dealer check the fuel filter. But if it is gummed up, that would be an expense of yours. As it is an expendable part. A red lighting is blinking inside my motorhome generator. What does that mean? The ONAN generators utilize this red light and the number of blinks to provide the owner with a few error codes. These error codes should be listed in your generator owner's manual. If not, you can find digital copies of the manual on the web. A few minutes after turning on our Onan Generator on our class C rig, it smelled like it was burning. What do you think the problem could be? Pull the covers off of the generator and inspect it for road debris. Then, examine the generator exhaust pipe for road debris. If everything is OK, then you need to get that generator to a service center. My RV generator is running, but only the microwave is powering up! What do you think is the problem? First of all, is your COACH shut-off switch turned ON? It runs on 110-VAC like the microwave. Secondly, is your converter (charger) keeping your COACH batteries charged? Check the voltage on the terminals of the Coach batteries. My RV onboard generator sometimes powers up the coach (microwaves/outlets) and sometimes it doesn't. It starts with no problem and transfer switch is fully functional and new. What could be the problem? From what you have told me here, your generator is functioning and running properly but you do not have any AC power in your RV, at times. If this is the case then you need to have a tech check out the "power generating" portion of your Generator. It sounds like there might be a problem there, or you could have a loose wiring from the generator to the RV power system. We just bought a new, never used Holiday Rambler Diesel Navigator 38F. The generator is a Cummins, and it won’t turn on, it just ticks. The batteries are brand new and show that the voltage is good, and I have the motorhome plugged into our home. Can you tell me what is wrong? The inside panel of my RV does not have a chocker position for my generator. The outside generator shows off and choke on the same switch. Do I push the off switch on the inside panel for a choke? I have a 1976 Chevy G-30 1 ton Marathon motor home. Where is the generator and the turn-on switch located? We have a 2017 Thor Chateau 24. On a trip, a pipe hanging underneath the RV that exits near the driver’s door dropped down. It elbowed up toward the engine. I removed the hangers and the pipe. The engine light was also on prior to me finding the pipe problem. Is this a generator exhaust or something else? A generator exhaust pipe is typically a 1-inch diameter pipe while the engine exhaust would be much larger, so let's assume the pipe goes to your generator. Other than that, your engine light being on can be an indicator of something simple most of the time. But, you need to get that checked as soon as possible. If I remove the onboard generator from my RV and install an inverter, can I use the existing wires that ran to the breaker box from the generator? Well, the short answer is yes, if you take care to wire the installation properly (wire size, fusing, etcetera. But or your Inverter to be effective, it would be required to provide at least either 30-AMPs or 50-AMPs (depending on your RV's overall AC Service) of AC Voltage from your inverter which in turn would require the addition of numerous extra COACH batteries and a much larger Converter to keep them all charged. Honestly, this would be an extremely expensive project with very little payback. Before I would consider such a task, I would look into installing a good auxiliary SOLAR system, designed for your RV. A friend of mine had a contractor design and install a fully solar power system in his motorhome and although the total cost was around $30K, he can go off-grid for weeks at a time using only his Solar system in his motorhome. First of all, your Ford Brougham has one battery for the engine, and depending on the year, it can have one or two batteries for the HOUSE (or COACH) equipment. The two generator start switches are there to give the operator the option of starting the generator from either spot. The generator has its own fuel pump, normally mounted near or under the generator itself. The fuel pump/fuel filter combination are two pieces that you will find in the fuel line and the filter must be clean and the fuel pump is powered when the generator start switch is pushed. A dirty fuel filter is the most common problem for an RV's generator, with a bad fuel pump being second. I would change both out. Hi Don I got a 1984 Ford Brougham. I can get the generator to run I just can't find a switch to flip the fuel pump on it's not getting gas and there's no obvious switch other than the generator start switchs. One on the unit one in the coach also trying to figure out where a wire goes underneath on the house batteries and I just found two more house batteries. Rebecca - Considering the age of your Bounder and its past service history, this is likely buildup in some of the oil lines and particularly in the oil pan. And I am assuming that your engine is not smoking and there is no heavy black buildup in your exhaust pipe. If there is buildup at the exhaust pipe you may be actually burning oil which can often be caused by worn piston rings. I would hope for the best and check with your local Ford truck service center and have them check the engine out for you. My 1988 bounders, oil is still runing black after new oil change , do you know what is causing this? Vidhan - You are absolutely right, there are a number of small portable generators that are quite adequate for the load a smaller camper will be. And, the size of the load a larger camper like a motorhome provides requires a generator that is hard to haul around, thus the reason so many have generators that are built-in. In fact, because of the smaller electrial load, there are several companies who make Solar Panel kits that can be installed in a Pop-Up or small towable trailer camper. They work well with an Inverter and there is not gas purchase required. CHeck these out for a viable power option, especially when you are out boondocking. Towables like small travel trailers, teardrop trailers, fiberglass eggs and even many pop up campers can be operated on a less expensive portable generator. Mark - I am not familiar with that particular external generator, but if it is only putting out such a low voltage then you will need to get it checked by a service shop. It may have internal problems that a user should not try to fix. truth2ak - Yes, I'm afraid so. But, in most motorhomes you will have a couple of receptacles that will be pwered by your Coach batteries via an INVERTER which uses the 12-VDC to generate a limited amout of 110-VAC. These receptacles exist normally to provide power for your TV sets and often for a computer receptacle near the passenger seat. When driving do you have to run the generator to run the appliances and outlets? 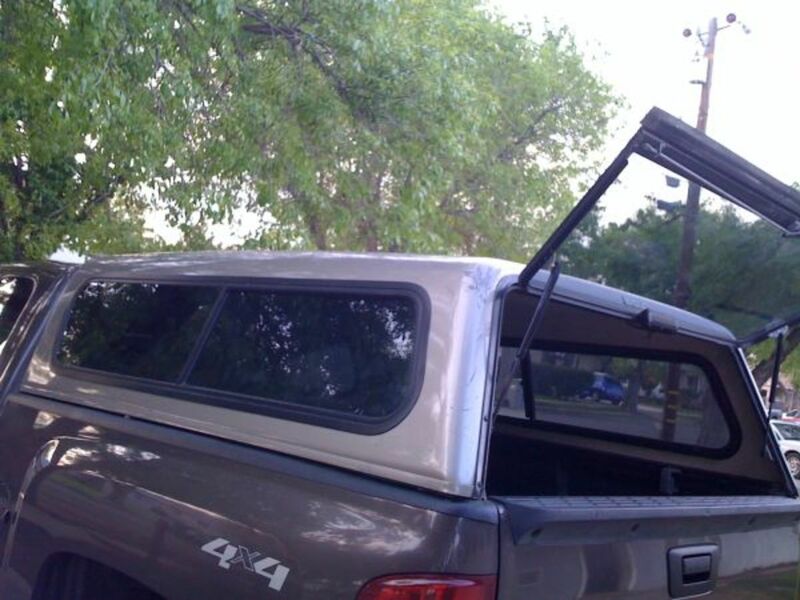 Lennie - Your Bounder is wired so that you can use it, even while on the road, for your roof AC's and other equipment. Your '96 will only have a 30-Amp service standard, so I would only run one of the AC units to avoid any problems with overloading the generator. FYI: Your RV has a power control panel which does several things allocating power to equipment, but most importantly it switches to the generator when it senses that there is a generator running. So, while sitting in your campground, plugged into campsite power, see if you can start your generator? Your Rv should sense it is running and switch the "transfer switch" over to the generator. If it switches over, then this function is working so you can then turn your Air ON. IF it runs OK, then your switching system is OK. If it doesn't run, then you are overloading your generator and you need to check it out. Bing new to you, I would suggest that you do the following to your used generator anyway; 1- change the generator oil and oil filter, change the fuel pump and fuel filter, and change the air filter. If it still doesn't take the load, you may need to get a generator tech to check it out for you; you can usually contact the generator manufacturer's customer service and ask them for the nearest certified tech. Being a Rv traveler for many years, I do suggest that you keep your generator serviced and in tip top condition. So, check the things I mentioned and have a great time with your new/used Bounder. I jis bought a 96 fleetwood bounder self contained with a 5000 onan generator and we cant figure out for the life of us, how to run the roof airs while going down the road, idk if we are not turning on the right switches on the main battery/and the other battery on the wall inside the rv, or if we are suppose to have it on 20 or 30 amp on the generator, but we cant get either air to come on while driving, but if plugged in at a camp, it will.....any ideas? Phyllis Waltman - First of all, an RV with a builtin generator also has an automatic switching power controller so that you can only have one thing providing power to your generator. So, to use your external generator you will need to be the proper adapter cables so that you can plug your RV into the generator when you need power while boondocking or camping anywhere other than a campground. But, check your RV to see if it has a builtin charger (Converter) that will use the ACV from the generator (or campsite) to recharge the Rv batteries. Here are some tips for you if you are going to use a generator, built in or external. 1- campgrounds do not allow generators at all or some few will allow their use up to a certain time at night. 2- Many Walmart stores allow RVers to camp in their parking lots for a day or two, but only if they comply with their rules. There is a Walmart group on yahoo called walmartrving, or something like that. Check it out. 3- Some cities, towns and counties do not allow overnight camping anywhere, but many do allow it in some places. Many people will overnight in church and large shopping center parking lots, but you must check the local laws. 4- I recommend that you get some one to expand your RV battery capacity, and keep them charged. Many people will run their RV on the batteries while cooking or watching TV (you can add a cheap Inverter that will convert 12-VDC to enough 110-VAC for one TV). They then just recharge the RV batteries the next day. Our son offered us his generator he used at his house to camp with our 5th wheel. My husband said you have to buy a special generator just for rvs. We did not buy an rv with a generator and in traveling can not stay free anywhere overnight. We we are on a low budget so I am anxious to hear what you tell me. Michael - First of ll, your RV batterie will only lat a few days with the load of a fan and a TV before they ill need charging. (PS What about the fridge, it uses 12-VDC??). Check and make sure the batteries are being charged when the generator i running, by measuring the voltage across the battery terminals. When being charged the voltage should be around 14.5 VDC, if it is 13.2 or loser it isn't being charged. It they ae being charged, then you only need to charge it occasionally. You might want to pick up a cheap solar charger for the RV to simplify your problem. I am a total newbee to the RV world, so please bear with me. I have a 5th wheel parked on a remote spot on my property. My partner's adult son is living in it. We anticipate that he will only be using power for lights, LPG heater fans and possibly tv. Would the 12 volt batteries suffice if they are periodically charged by the LPG Onan generator that is currently in the trailer? If so, for how long would it need to be charged? Also, I have a deep auto battery charger that I typically use by plugging into an outlet in my garage. Could this be used to charge the trailer batteries (by toting the batteries back and forth from the remote area to the garage)? I appreciate your tips. pbtwins - Yes, your Rv is designed for your Gen. to be your major power source, and your RV does not need to be operating. Also, when you turn your generator ON, your RV power control panel will automatically switch everything OFF of your campground (or external) power. Great article! I am a newbie and my question is do you turn the engine off when you use the generator? how does that work? we have a 1993 fleetwood flair class a Thanks! Elizabeth - Standard clothes dryer, water heaters and electric Furnaces will typically require 220-VAC to handle the high currents required. On the other hand, if you used a solar-assisted water heater and maybe a propane furnace the current needed would be significantly less. Of course if you're talking about a motorhome you have to use what fits their designs. I was wondering, since you seem to know a lot about generators, if I were to use a generator for heating water, a washer and dryers and for heating, what kind of voltage should my generator have? Diana - First of all, an RV with a built-in generator is usually designed to handle the full load of power that the specific RV might demand. Secondly, it is wired into the RV so that is is safe to use, as well as being set up to "kick out" if there are any kind of wiring problems. So, trying to use a larger capacity generator is not recommended without having a certified electrician wiring it properly. Hi,,, We are renting an RV (2016 Coachmen Leprechaun) and we were wondering if we could plug in our generator instead of using the generator that the rv comes with? Steve - Sorry, but you said it yourself; the life of a diesel generator is dependent on how well it is maintained. I have seen people in 20 year old diesel RV's whose generators are still running great, and I've seen some getting major repair after only a couple of thousand hours of run time. There are just too many variables involved. One thing I would suggest is for you to pull out the generator manufacturers owner manual and read how far out it projects their maintenance schedule?? Sorry again. Hi Don, I am looking into buying a used DP. I was wondering how many hours of run time on the diesel generator is too many. I can assume it will depend on how it was maintained. But can you ball park it for me. Jim - our RV system is designed to do this. When your generator is running then it will not allow your external power source to be accessed. If there were two sources on the same appliances, etc, there would be some serious electrical damage in your RV. Dave Gutman - All gas powered Onan generators I know of are cut OFF by removing the 12-VDC from the fuel pump. I would change the fuel filter and the fuel pump. They are relatively cheap and easy to replace. secondly does the generator use 12v feedback in any way outside of starting , it cut out and realized my battery connection were loose ..
Mark Deerhelm - Running your generator regularly, such as once a month IS a good idea. The reason is that over time the gas (and additives) in your fuel will evaporate and leave a residue that can "gum up" the fuel filter or fuel pump, or some of the parts in the carburator itself. by doing this, you keep everything cleaned out and ready to run efficiently. And, running the generator, if it's wired up properly, will not harm anything in your RV. We have a diesel Winnebago Vectra 2004 with an Onan generator. When the generator is turned on, it runs for 5 minutes then quits. Do you have any idea why it might be doing this? Rex - If your Tropi-Ca was originally wired for a generator, then you should be able to run the AC off of the generator as you travel. This has been a common way to keep your coach cool when traveling in very hot climates with motorhomes for decades. So, hook it all up and run your own test. I'm restoring a 1997 National Tropi-cal with a generac 55k built in generator. Almost done and about to do an 18 state coast to coast tour. The a/c from the engine works well now. But this thing is 36 feet long and the rest of the coach ain't so cool. I'd like to run aux zone a/c off the generator while trucking down the road for comfort of others. Is that an option or is there another way. My first motorhome. I'm ignorant. Susan - First of all, almost all campgrounds do not allow generators to be used. They generate exhaust fumes and they're noisy. Second, I have had several motorhomes with a 5K-Onan generator, and with a half-load on the generator, it will burn around 1/3-to-1/2 of a gallon an hour. Whenever we dry-camp, my wife and I fall into a routine where we only run our generator in the morning, and then for preparing dinner, and finally at night when we are relaxing, maybe with a little TV, before bedtime. We are wondering how much gasoline a generator uses if we ran it overnight if we were dry camping. And if it is more economical to dry camp in a campground or to use electricity provided. Do we save money getting a site with no electricity rather that one that does. Jamie - The newer RV's have conventional fridge units the same as in your home. But most use a 2-way fridge that operates either on 110-VAC or on propane. If you have one of these in your RV, then you'll be OK. If not, I can only recommend the purchase of a very large, high-quality cooler filled with ice. 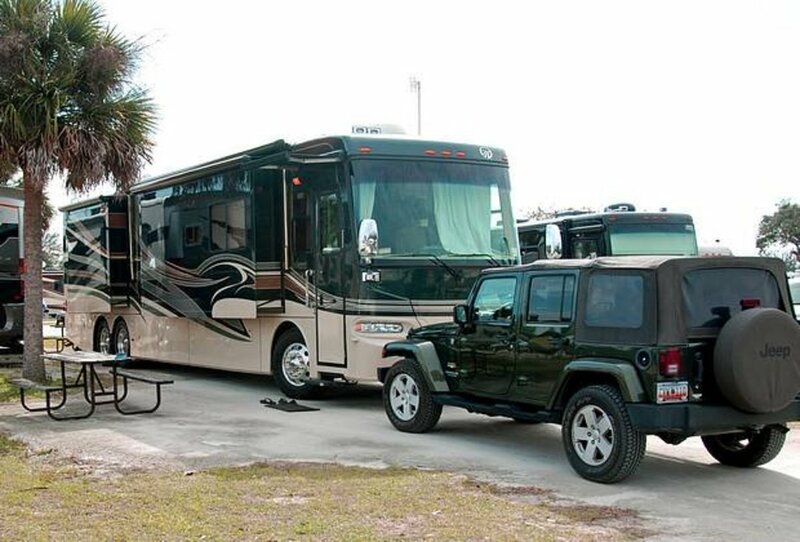 SUZY - RV Resorts and Campgrounds will almost all provide power hookup for your RV. In fact with these campgrounds, they do not allow you to run a generator except under specific conditions. RV's have generators for use under tow conditions; 1- rough camping in wilderness conditions, or 2- when you stop in a rest area or truck stop and need power while you cook or sleep. Some motorhome owners will run their generator while driving if the outside weather is so HOT that the dash AC cannot keep the RV interior cool. Otherwise, you shouldn't be using your RV generator very much at all. Hello, im about to rent an RV and travel from Texas to Nevada and plan to stay at several RV camps and resorts therefore will I be needing the generator alot.. I ask because they charge us an hourly usage of generator. Thank you in advance we are new to RV world. Leonard Jauquez - Your generator is designed to; 1- keep your house batteries charged, and allow you to operate in a state park or out in the wilds where there is no power for your V. It powers your inverter so your 110-VAC appliances and air conditioner will work, and it uses the same gas tank for fuel. I hope this explains it for you. I have a 1975 executive, not sure what my onan generator does for my rv does it have a inverter 4000 watts gen.
Walter Brokx - Most motorhomes will have two switches (that control high-current relays) that will turn OFF or ON 12-VDC to your Chassis accessories and to your Coach accessories. They are for use when you park or store your RV so that your batteries do not get drained. Check for these switches first. Typically, your RV generator will utilize your Coach batteries, but when you start your RV, these relays can be turned ON. So, your most probable problem is having your Coach switch turned OFF. Larry - First of all, most motorhomes have a safety feature where the fuel line for the generator only goes down into the fuel tank to the 1/4-full level.Tis is to prevent campers from becoming stuck in a far-away campsite with no fuel to get out. Second, replace your generator fuel filters. Diesel fuel is pretty dirty and filters can get clogged. These are the two most probable causes of your generator turning off. Help what can i check or replace. My c coach has 2 batteries to start the generator. But when i start my Coach Ford 450 engine the generator will start. IS there a relay or something ? Vince - RV generators are air-cooled, so I'm not sure what yours is. But You didn't mention the fuel filter for the generator. Diesel fuel is a dirty fuel, so I would immediately change the fuel filter. On some Rv's the fuel filter is attached to the generator while on others, it may be mounted on the RV chassis near the Generator. This filter must be changed regularly, and I suspect it's your problem. If not, it's time to take your Rv to a service center so a PRO can check the Gen out. The two most common problems with RV generators are; the FUEL FILTER and the FUEL Pump. Over the years, I have had to replace both on several generators. These two parts on these Onan 5500 generators are usually mounted under the generator. If you crawl under there you will see the pair mounted with a couple of screws. If you are interested, I have written an article on how to replace these two items. It is called RV Generator maintenance, How to replace your Fuel Filer and fuel Pump. My gen wouldnt start or run. suspected bad carb. Onan 5500 Gold. spent the $$$ on the carb, installed it and viola, it ran, for about 5 min anyway, and not will not run again. HELP!!! Teri- OK the steps and your internal lights are 12VDC. If they all work then your DC COACH system is OK. If your Microwave actually works, by that I mean heats, then you have 110VAC coming into your Class-C OK. If all of your breakers are actually functioning then your AC distribution system is OK. If your Roof AC works and you just do not have power to your appliances plugged into receptacles then you probably have ground fault receptacles that have kicked out. Find the master ground fault receptacle and reset it. mona- Without any other information, on your RV or generator, I can say that almost all Onan generators are "self-contained" and that yourt fuel filter will be found under the covers. Just find the fule line going into the generator, and it should go into the covered unit and connect to the fuel filter itself. One other thing. Some Class-C motorhomes are built on truck frames and will have an original truck/van fuel tank. And, many of these tanks have the fuel PUMP built inside the tank itself. You should checkthat this is working properly also. we have aclass c motorhome with a onan gas generator, we arent getting any fuel. does this generator have a fuel filter and if it does where is it located? Dave, Almost all of the generators on older motorhomes require that there be at least a little load on them or they will cycle and give you poorly regulated output voltage, but yours sounds like something else. First,you say that the lights go on and off but the outlets still work? Do you mean that if you plug a lamp into a receptacle the camper lights cycle on and off but the lamp in the outlet doesn't? IF the lamp cycles also, then I recommend that you get your generator checked, things like; 1-a clogged fuel filter, clogged jets in the carburator, rotten fuel lines to the generator allowing air into the fuel line, are some the most probable causes. PS. Turn on a TV and see if the lights cycle then. Sorry keelym. But a Motorhome usually, either has a separate generator that, for convenience runs on the same fuel type as the RV itself. And,with either,you generator is your alternate power source for your camper accessories when you are parked and do nothave anyother power source available. Thanks for the comment though!. Thanks Jesse, I hope you enjoyed the article. MAny people don't understand that these RVs are complex equipment, and include a lot of accessories that require the concerned owner to learn many different skills, even if only to understand when something in the RV requires maintenance, or not.